Create a festive atmosphere at a young lady's quinceanera with creative centerpieces that go beyond tiaras and traditional flowers. The centerpieces decorate the quinceanera tables and enhance the colors and theme of the event. A candy-themed quinceanera is the perfect setting for a whimsical cone candle centerpiece. 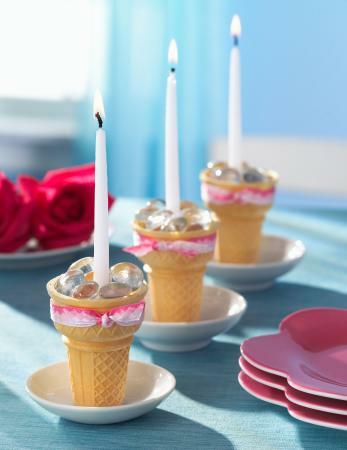 To make it, tie a small ribbon around ice cream cone serving dishes. Place a tapered candle in the center and fill it with clear glass beads. Place in a small dessert plate. If the venue bans burning real candles, swap them out for tall lollipops. Look for ones with a traditional multicolored spiral for a bold look. There are also various types of cones available for purchase: a short votive in a waffle dish would work just as well. Pink and black are a trendy color combo for a quinceanera. 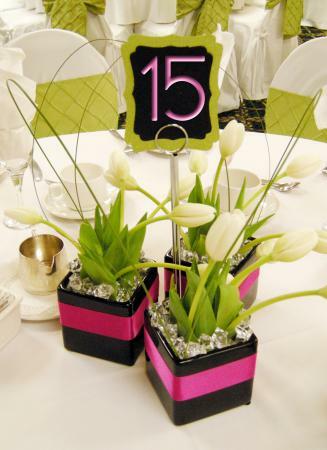 Get this centerpiece look by purchasing black square vases and wrapping a hot pink ribbon around them. Add a little potting soil and white tulips with greenery. Put clear crystal rocks around the top. Write '15' on a chalkboard sticker and place in the center of a trio of vases. Other great color combos to try include turquoise and gray, red and black, and silver and gold. You could also use the birthday girl's favorite colors. Use groupings of three to create the right look. Skip traditional candles and flowers for a glowing gem centerpiece. Place a small LED votive in the bottom of a pillar vase. Cover with clear gems. Add one or two small, metallic and crystal branches that stay below the mouth of the vase. The centerpiece is the perfect option for an elegant dinner and dance, or if the birthday girl is unsure of a theme but you want to get started with decorations early. 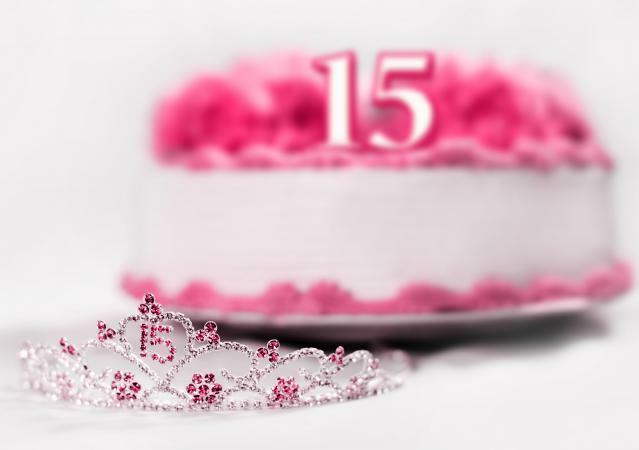 It will fit into a number of different quinceanera themes. You could also select a LED votive with a colored bulb to match the rest of the décor. 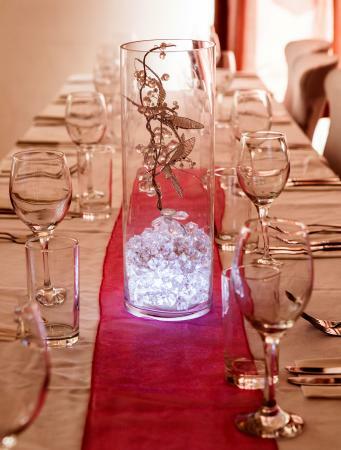 A luxury quinceanera deserves a centerpiece that stands out. Purchase tie-dye roses (also known as rainbow or wild rainbow roses). Put them in a small, low vase with Styrofoam. Add bright pink or fuchsia ostrich feathers around the bottom. Then add some tropical greenery behind the flowers with sparkly pink branches. 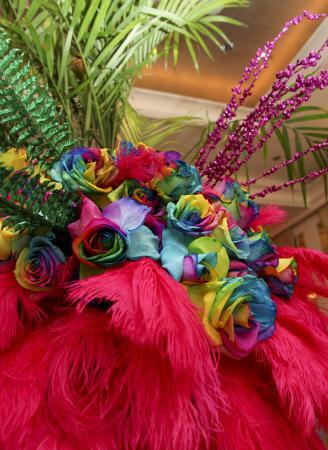 The tie-dye flowers combined with the feathers is a fantastic option for a circus, fairy, princess, or even a boho-themed quince. Use them on your larger tables and place matching mini arrangements of only feathers or only roses on the smaller tables. Animal prints don't have to look cheesy at a quinceanera. Make this centerpiece by picking up a tall gold vase. Spray paint tiger stripes using a stencil. Add a gold fabric bouquet to the top of the centerpiece. You could also use faux flowers that have been spray painted gold to create the bouquet look at the top. Select these centerpieces for an upscale circus theme or even an Oscar or Hollywood theme. You could also go with black and white for a zebra-striped look. The centerpieces will tie the decorations, theme, and rest of the table styling together. 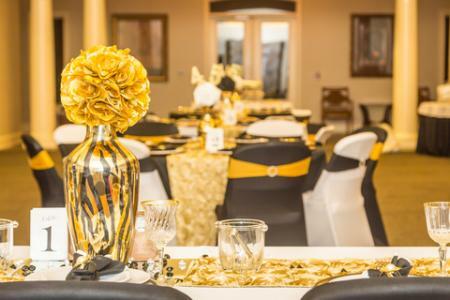 Even if you don't have a particular theme in mind, you can switch up colors and accessories in the centerpieces to create the right look and match the rest of the event. Speak with your florist or event coordinator to see what the venue provides and any restrictions, then start planning the quinceanera decorations like centerpieces. With the details completed, you can spend your time focusing on your daughter's big day!